Foreign policy is an integrated structure of assumptions, objectives and means. Critics of American foreign policy contend that the decisive factor of the failure of U.S. policy toward China has been the imbalance between political ends and military means. Professor Tang Tsou’s classical study “America’s Failure in China 1941-1950” fully documents and illustrates U.S. policy-makers’ unwillingness to use military power and espousal of idealistic objectives in China policy. President Barak Obama was widely criticized as being weak and indecisive, for he failed to enforce the red line he laid down in Syria, and was unwilling or unable to use force to stop Russia’s invasion and annexation of Crimea. Will his “pivot to Asia” (or “rebalance”) strategy suffer the same grave defect? Obama once thought of China as a responsible international “stakeholder” and assiduously sought its help and cooperation to cope with regional and global problems. However, Beijing has its own agenda and has been obstinate and unwilling to accommodate. China’s hegemonic ambitions in Asia Pacific, especially its militarization of the South China Sea in the past several years, have shown Obama that his own basic assumptions about the Chinese leadership and its foreign policy are not in line with reality and the emerging trends. Thus, he has reached an alarming conclusion that the rising China is challenging the Pax Americana and that Xi Jinping’s China Dream is a blueprint to supplant America as the global superpower. China’s claim of sovereignty over all the SCS islands and their adjacent waters overlaps with those of the Southeast Asia countries and Taiwan, and causes growing wariness from the U.S. and its allies. In recent years China has also constructed seven artificial islands in the disputed Spratly archipelago and has built airstrips and military posts, ignoring the protests of neighbors. Contrary to Chairman Xi Jinping’s pledge during a state visit to Washington in September 2015 that “China does not intend to pursue militarization” in the Spratly Islands, China has recently dredged a deep water port, built a military runway and deployed fighter jets and surface-to-air missiles on Fiery Cross Reef, one of the seven artificial islands in the Spratlys. Moreover, in addition to the deployment of missiles and fighter jets to the disputed Paracel Islands, China is building a military outpost on Scarborough Shoal, 230 km off the Philippine coast and within its claimed exclusive economic zone. The Philippines claims the Scarborough Shoal, but China took effective control of it in 2012. Construction of the outpost will include a military-capable airstrip, enabling Beijing to project power across the SCS and present an overt threat to the Philippines, an American ally. To counter China’s expansionism and growing military reach in Asia Pacific, the U.S. is strengthening alliances and, for a change, placing a greater emphasis on the display of military power. In the first half of April, The U.S. and the Philippines held a 10-day joint military drills, with Australia sending troops to participate in joint exercises and Japan dispatching three warships to visit a Philippine naval base. Manila announced that the Philippines would make five military bases available to U.S. forces according to a new defense agreement. U.S. Defense Secretary Ashton Carter, who was in Manila at the end of the joint exercises, stated that six high-powered American aircraft and three helicopters, together with 200 crew members, will remain behind at Clark Air Base “to contribute to regional security and stability.” Carter also said that the U.S. had begun joint patrols of the SCS with the Philippine navy, and the air forces of the two allies would do the same soon. Prior to his trip to Manila, Carter also toured an Indian aircraft carrier, the first time an American defense secretary had done so. He disclosed new U.S.-India military agreements afterwards — the U.S. would help India upgrade its carriers, and the two nations would cooperate on logistics and other military technologies. India was once a leader of the Non-aligned Movement and rather reluctant to engage with the American military. But the rise of China’s military power and expansionism has changed India’s attitude and policy — India now seeks to bolster its security ties with the U.S. and Japan. There are unmistakable signs that Chinese expansionism has backfired. China’s militarization of the SCS and its ambition to dominate Asia Pacific is counter-productive and a huge diplomatic setback, as Beijing has prompted the new U.S. military initiatives to contain China’s hegemony and induced many of China’s neighbors to enhance security cooperation with the U.S.
A few serious questions must be answered: Is Chairman Xi in command of the People’s Liberation Army (PLA)? Does he support the military buildup in the SCS? Is it possible that the PLA has hijacked such policy? In mid-April. Gen. Fan Changlong, the Vice-chairman of China’s Central Military Commission and the highest-ranked PLA leader, made a high profile inspection tour of Fiery Cross Reef to show support to China’s territorial sovereignty and maritime interests in the SCS. Currently, the PLA is conducting exercises in the SCS with warships, submarines, aircraft and troops from the garrisons in the Spratlys and the Paracel Islands. Meanwhile, an American warship, the William P. Lawrence, a guided missile destroyer, sailed on May 10th within 12 miles of Fiery Cross Reef to challenge China’s claims. The U.S. operation was carried out to demonstrate the the right of freedom of navigation and oppose China’s efforts to restrict navigation in the strategic waterway, according to a Pentagon spokesman. As a matter of fact, the U.S. resumed the freedom of navigation patrol last year and has since carried out such patrols regularly in the disputed Spratlys and the Paracel Islands. On April 15, for example, Secretary Carter rode a helicopter to visit a Nimitz-class nuclear-powered aircraft carrier, the John C. Stennis, as it cruised through the SCS near waters claimed by China. Actions speak louder than words. The U.S. is placing greater emphasis on military power to enhance its rebalance strategy and to contain China’s hegemonic ambitions. The Pentagon has, in earnest, taken concrete measures to strengthen the U.S. military forces in the region, with additional personnel, more powerful and sophisticated ships, aircraft and equipment to counter China’s rising military power. U.S. officials have indicated a steady military surge. Sixty percent of its ships and aircraft will be deployed to the Pacific by 2020, up from about half before the start of the rebalance strategy. A free, democratic and secure Taiwan is a vital American security asset. U.S. policy-makers must recognize Taiwan’s strategic importance and the role it can play to enhance the the rebalance strategy. Hence the U.S. must do whatever it takes to help Taiwan defend itself and support the freedom of its 23 million people to determine and safeguard their future without intimidation from outside. 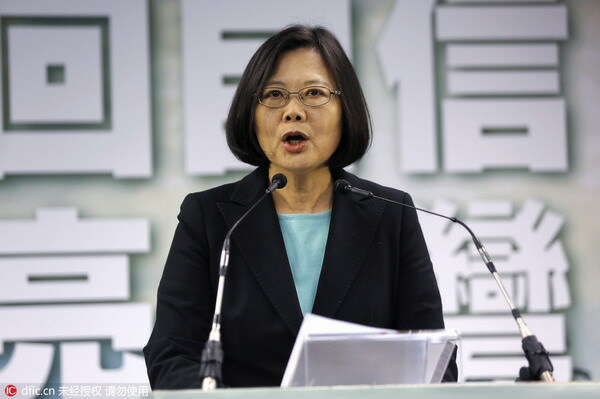 On the eve of Dr. Tsai Ing-wen’s presidential inauguration on May 20th, a statement separately but jointly issued by the U.S., Japan and other democratic nations, opposing China’s coercive or provocative action toward Taiwan would be timely and essential. Dr. Parris H. Chang, professor emeritus of political science at Penn State University and former deputy secretary-general of Taiwan’s National Security Council, is CEO of Taiwan Institute for Political, Economic and Strategic Studies.